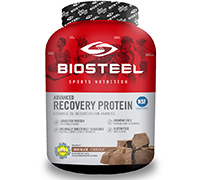 The BioSteel Advanced Recovery Formula is the new standard in post-workout nutrition. Featuring the Bio-Pro and Bio-Gen tri-phasic systems, the BioSteel ARF delivers the most potent post-workout formula available. BioSteel has pioneered the incredible new Bio-Gen formula designed to rapidly re-load and replenish the muscles with glycogen following intense exercise. Our unique blend of complex and simple carbohydrates in their healthiest and purest forms offers the best combination of health and performance benefits. Utilizing a unique blend of the highest quality and most bio-available post-workout carbohydrate sources available, Bio-Gen is able to enter into the bloodstream and begin to immediately repair and rebuild the muscle after intense training. BioSteel's protein blend utilizes three unique individual proteins each with varying digestive rates and distinct amino acid profiles. This combination ensures that following your intense workouts or games, your muscles receive fuel immediately and continue to be flooded with growth generating and muscle repairing nutrients throughout the recovery period. Safe & Anti-Doping CompliantEvery production lot of BioSteel's ARF undergoes comprehensive testing from an accredited lab and prestigious banned substance screening program with WADA and Anti-Doping experience. Several hundred Professional and Olympic athletes using BioSteel's ARF over the last 6 years have undergone hundreds of random drug tests, all without incident. Immediately after training/competition, mix 1-3 scoops with 250mL-1000mL of cold water or beverage of your choice.